Autumn, tinged in bittersweet emotion, is arriving on the familiar formation of goose wings. As a teacher and stepparent, next month I welcome the school routine and falling back into regular working, sleeping, and eating patterns. 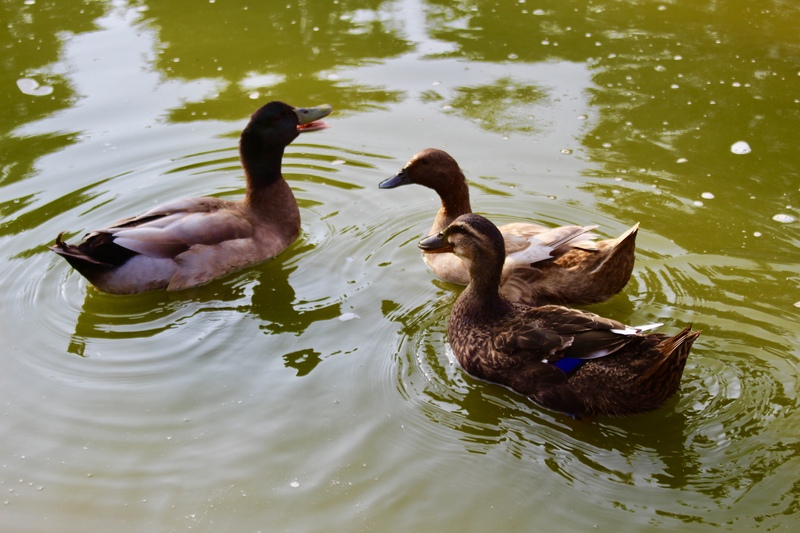 While I will miss late morning coffee sessions pond side with our three noisy and entertaining ducks — Lucky, Dante, and Beatrice — I am ready to embrace the next chapter. Living on a farm I find that I trust my senses more to announce the transition of seasons in the landscape. I analyze the birds circling the sky, measure the way the morning light radiates with a golden filter through the pasture, and I capture various spicy scents in the air. With a renewed concentration I anticipate watching our honeybees visit the gladiolas and sunflowers in our yard (they will be blooming soon) and imagine their amber honey in our mugs of tea this winter. I take nothing for granted. Every moment of beauty I witness becomes a fleeting reminder of nature’s last dash for vibrancy before everything is covered in white fleece. 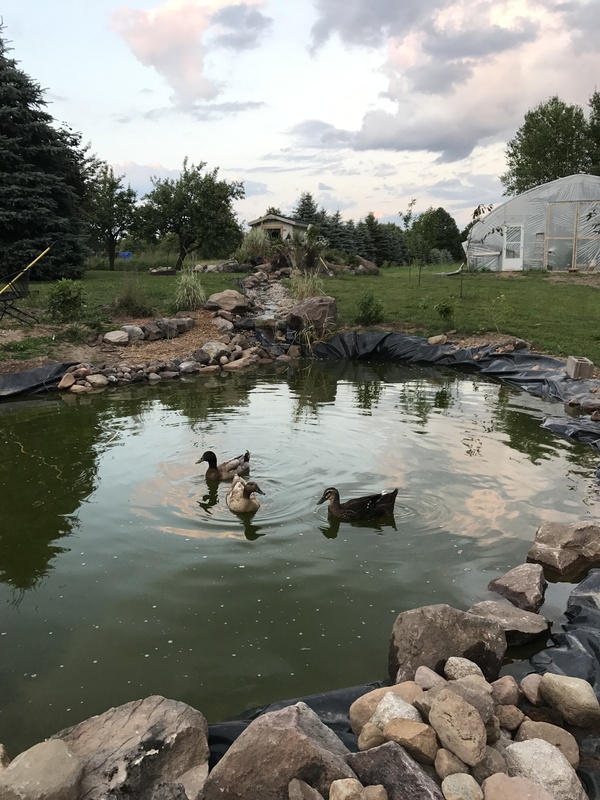 The new pond that John is building. It has a “rushing river” (inspired from our honeymoon in Alaska) and a waterfall. Weather wise, it has been a challenging Upper Peninsula summer. While the lake levels took full advantage of rain, I heard friends and family mourn lackluster gardens. On the contrary, my husband John and I grew the best garden we both have ever had. 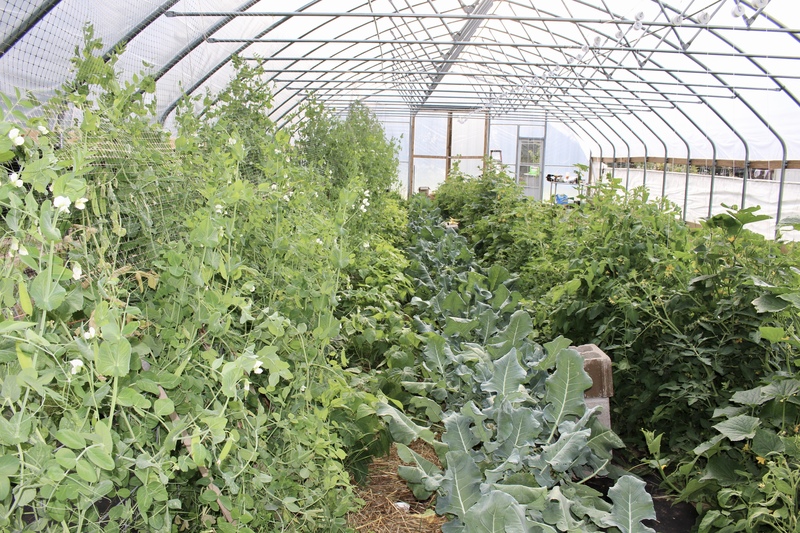 We were fortunate to acquire a hoop house last year with a grant from the USDA. John, always the industrious workaholic, braved icy fall and spring weather constructing its massive structure and we were able to start planting in April. 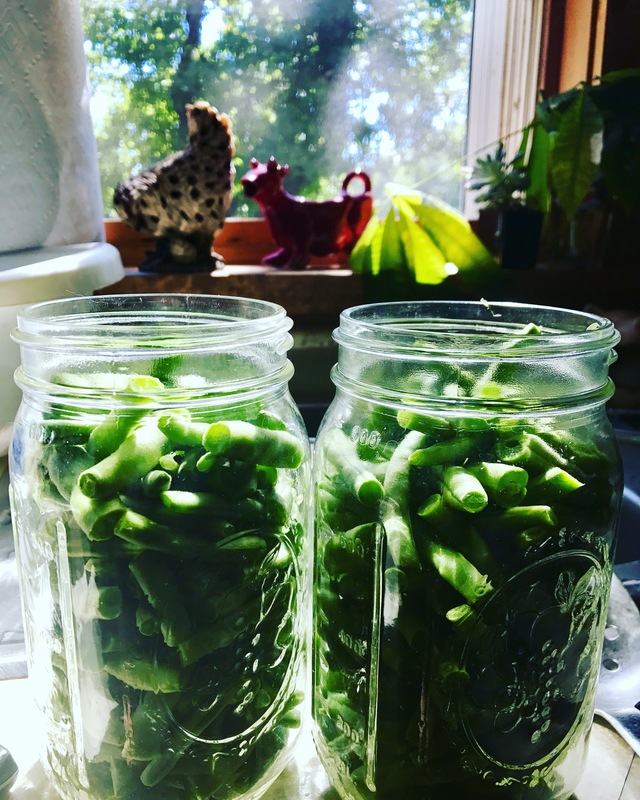 We were thrilled to harvest broccoli, peas, and beans the first week of July (greens much earlier), and in addition to eating fresh produce, I have been canning, blanching, and freezing at a steady rate. 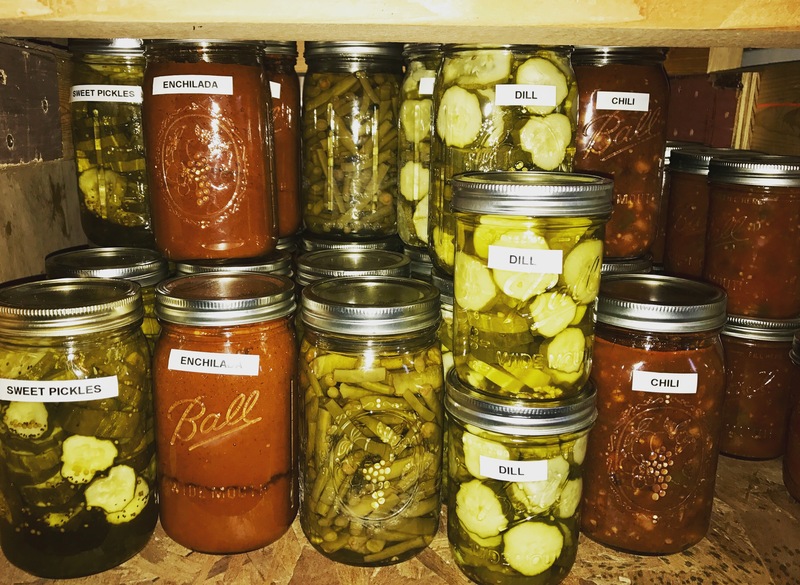 Our goal is to put up enough vegetables to get us through until next summer. 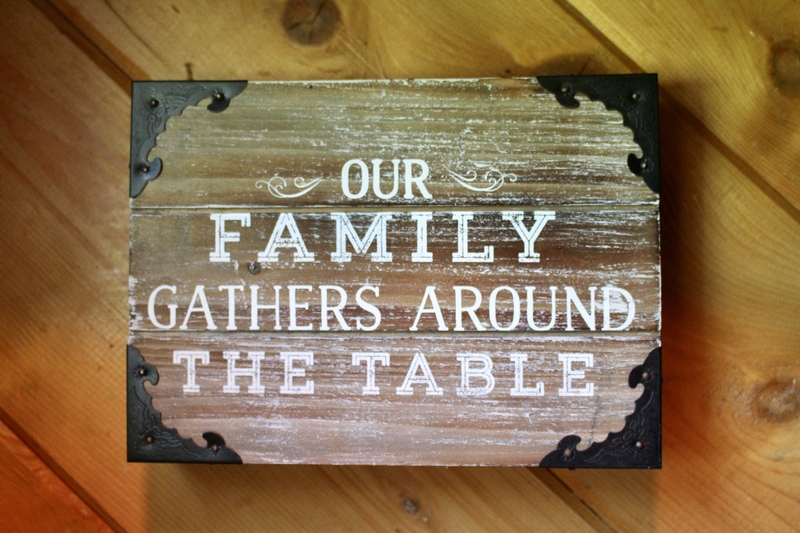 It has been a lot of work, but it is worth it knowing where our food comes from – our own backyard. 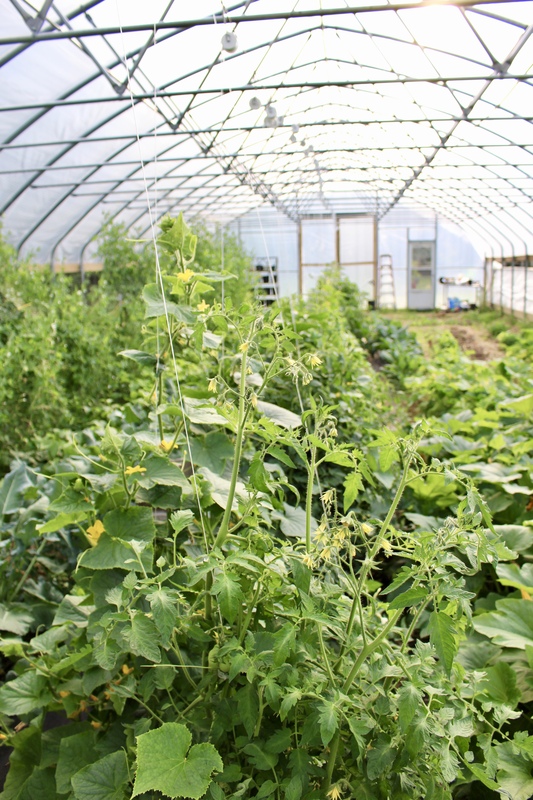 It’s been a dream come true to have this incredible hoop house. It has been a dream come true to pick fresh greens daily for salads and have a variety of fresh kitchen herbs at my fingertips. While I always have felt that my happy place was my classroom, I also enjoy letting my creativity bloom in the kitchen. As I always say, there is a close relationship to cooking and writing poetry. 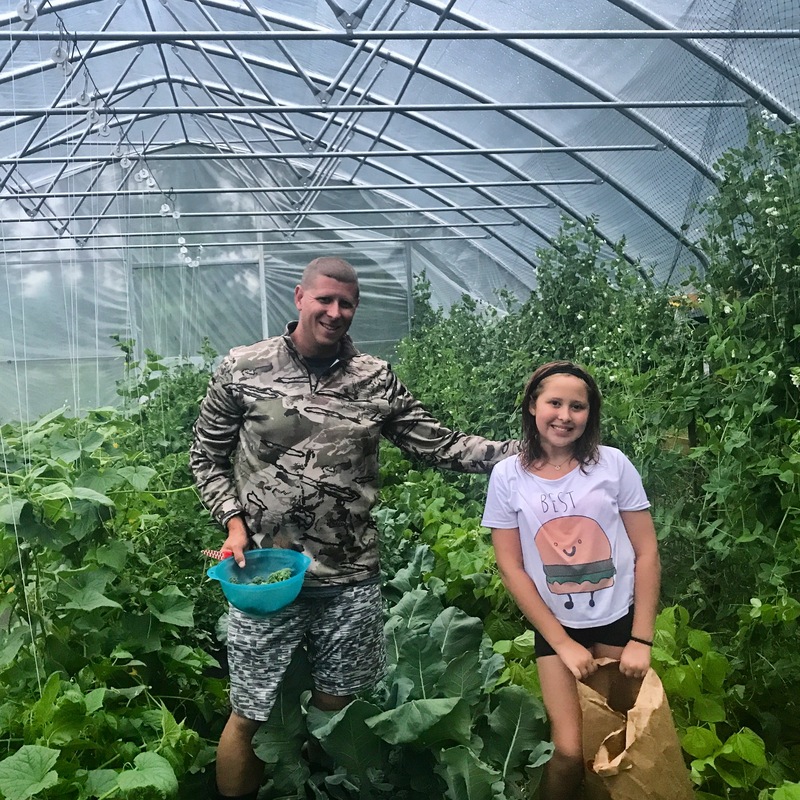 John and Avalon picking peas. 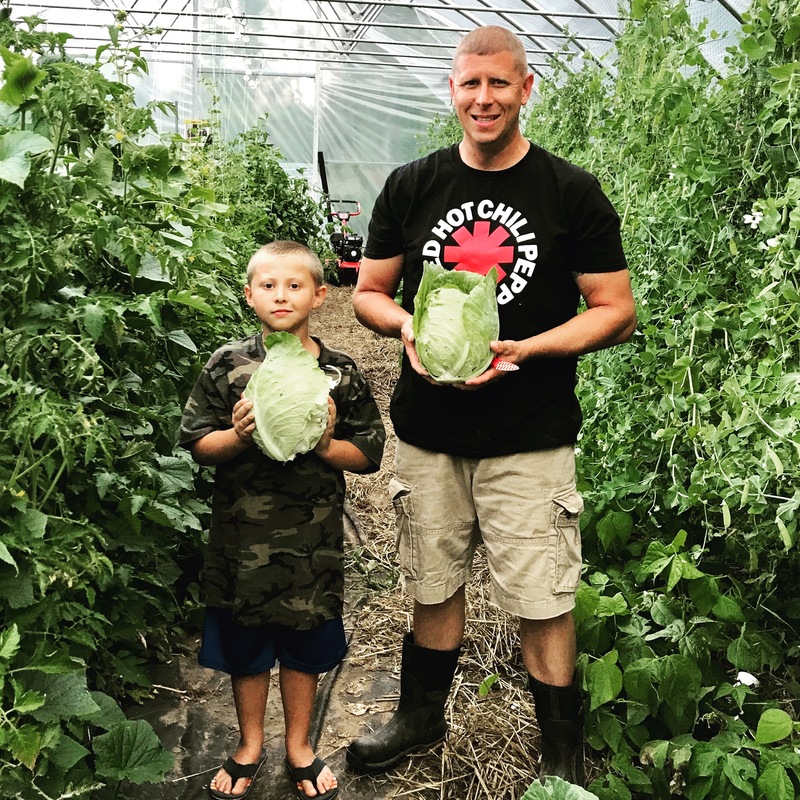 Lukas and John picking cabbage for sauerkraut. 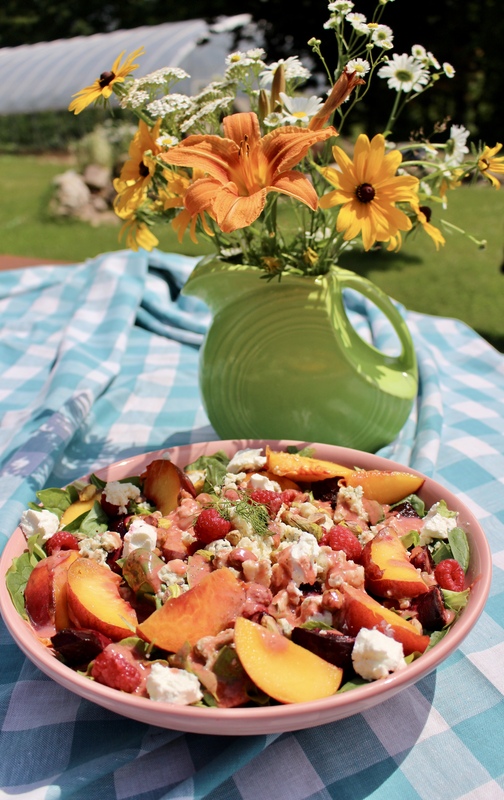 The salad recipe that I am sharing with you today was created in celebration of a visit from my Muskegon in laws. While my husband John fired up the grill to prepare barbequed pork ribs (raised on our farm) I prepared sweet potatoes, cheese bread, broccoli, and assembled a salad with fresh greens that I hoped to be beautiful on both the eyes and the taste buds. 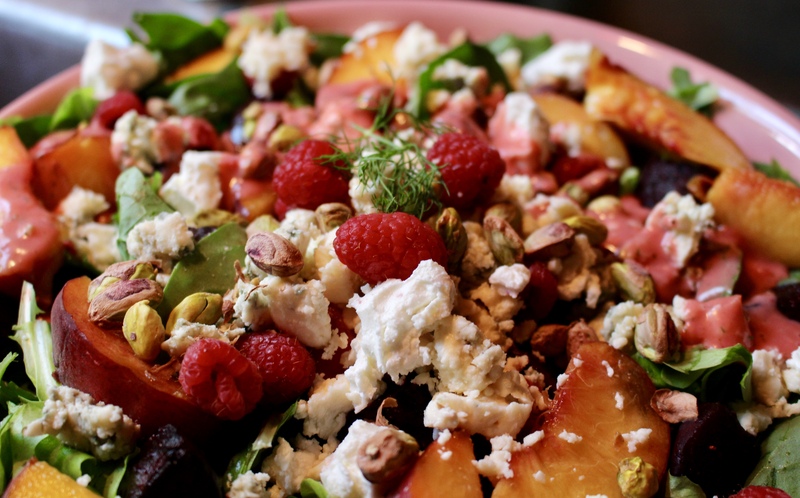 I combined fragrant and rosy peaches with earthy and sweet roasted beets, plump and tart raspberries, crunchy and buttery pistachios, and creamy goat cheese and gorgonzola. The dressing honors my Scandinavian roots with the addition of tangy dill (beets and dill are a wonderful flavor combination). 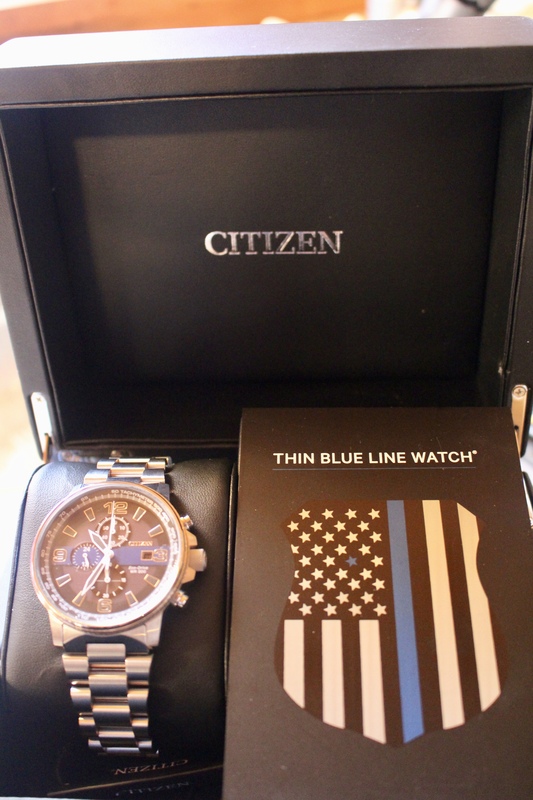 I think that I achieved my goal, but you will have to try it and see for yourself. 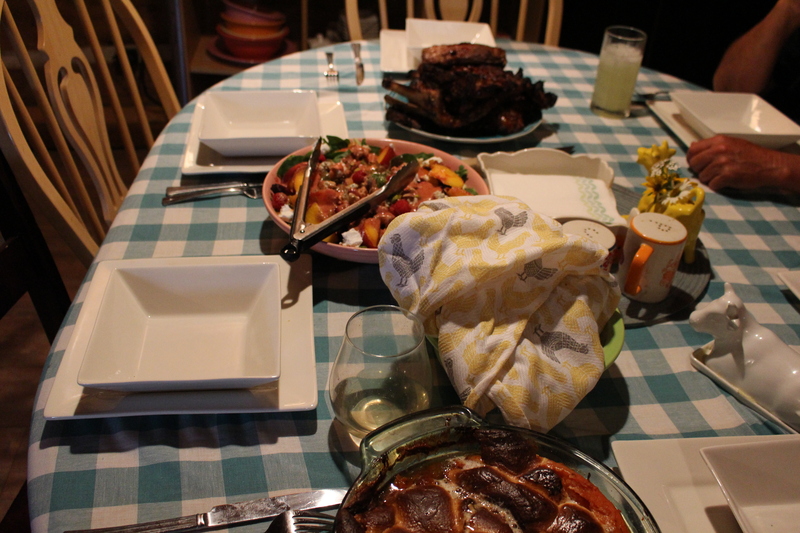 I made one large family style salad and it served five adults. This salad would also make a fantastic Mason jar salad (remember to layer the dressing first and the greens last so the salad does not get soggy). Preparing beets can be a bit messy but their sweet flavor and silky texture makes them worth the mess. Cut the beets into several pieces. Scrub well and leave the peelings on. If you have smaller beets you can cut in 1/2 or thirds. Once they are done roasting the peels will slide right off. 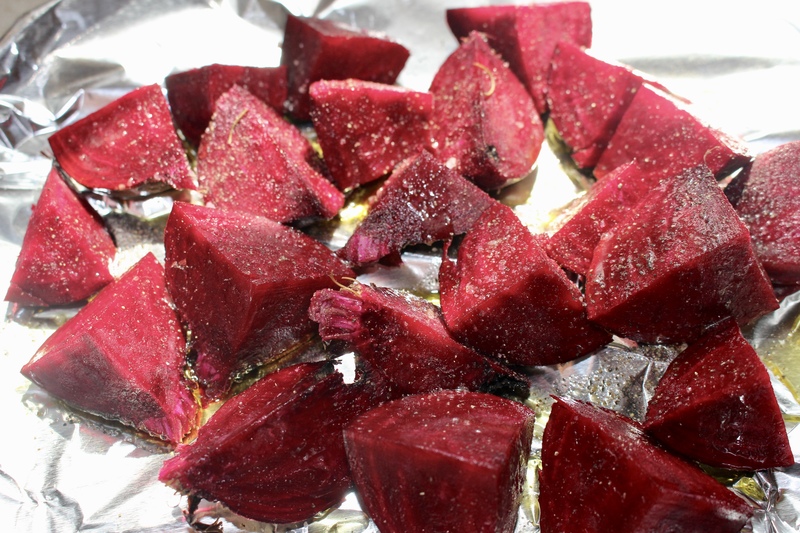 Roast the beets for 40 minutes at 450 degrees (time may vary depending on your oven). After 20 minutes give them a toss. Let the beets cool before making the salad. The beets can be prepared the night before. 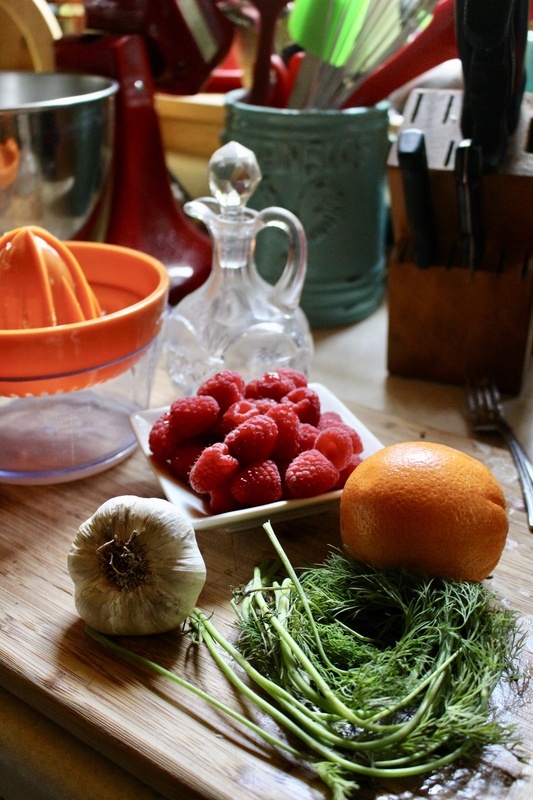 To make the dressing you can chop the berries, onion, and dill, finely mince the garlic and whisk all of the ingredients together. However, the best method that I have found is to put all the ingredients into the blender and give it a good pulse. If you want to make the dressing more visually pleasing you can add some chopped dill to the final product. Store in the refrigerator in a cruet or Mason jar and give it a good shake before serving. Leftover dressing will last for a few weeks in the refrigerator. 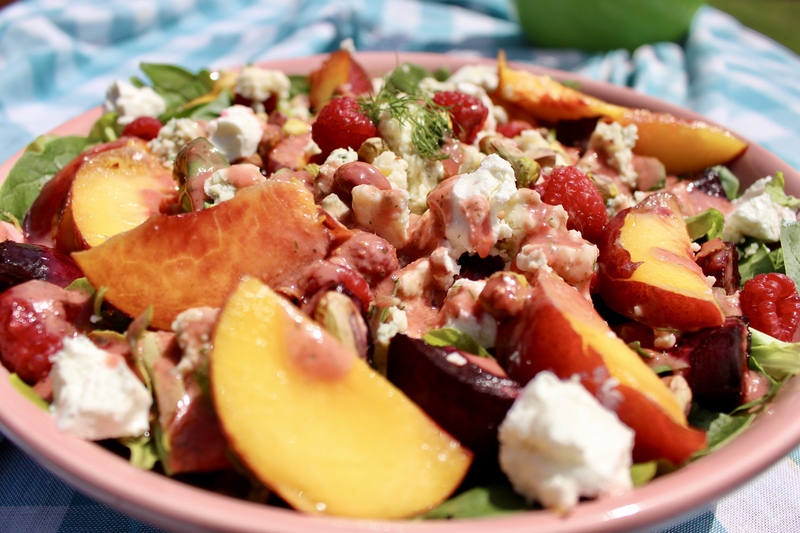 Arrange the greens, beets, raspberries, peaches, and cheese in a large bowl or on a platter. Pour on the dressing and sprinkle with pistachios (the dressing could also be served on the side). 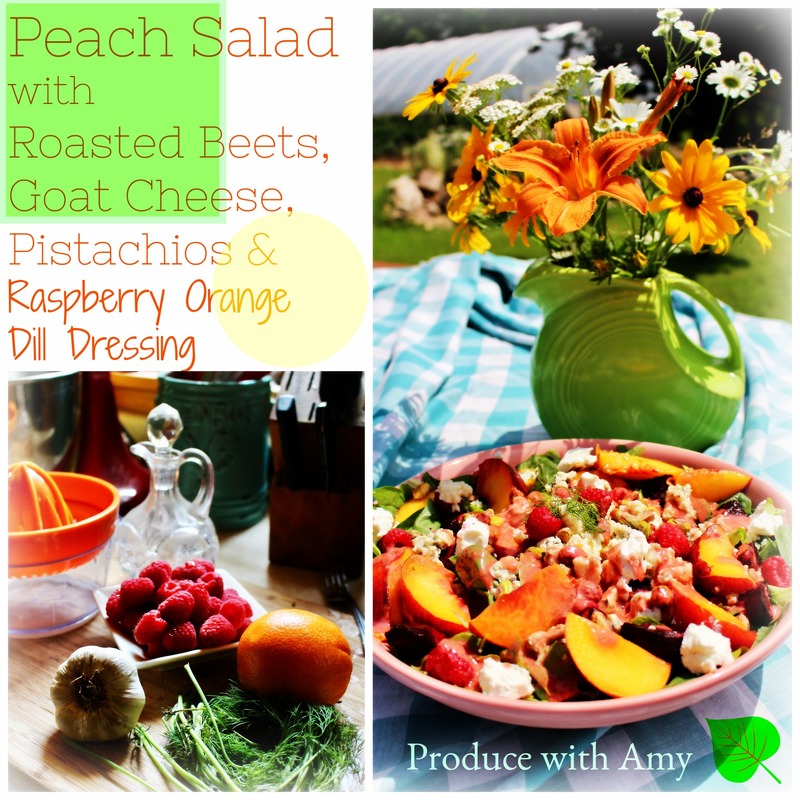 I did not toss the salad since I wanted the lovely beets, peaches, and berries to be on the top. Serve and enjoy! I hope that your transition from summer to fall is a peaceful one. 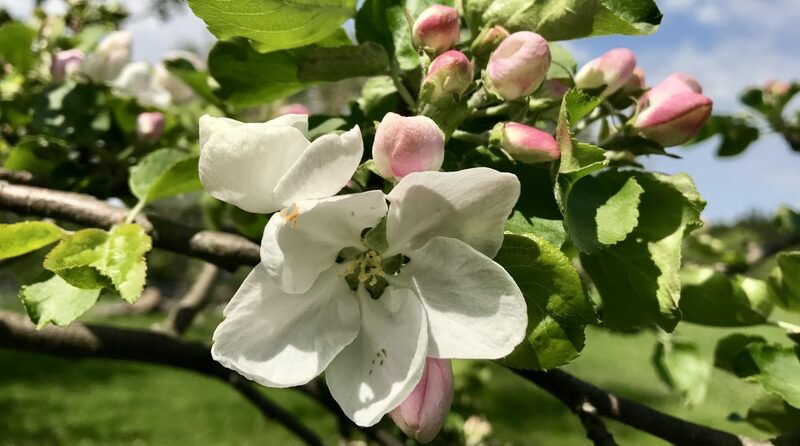 The Waldos will be celebrating a Marquette county autumn with apples from our orchard. 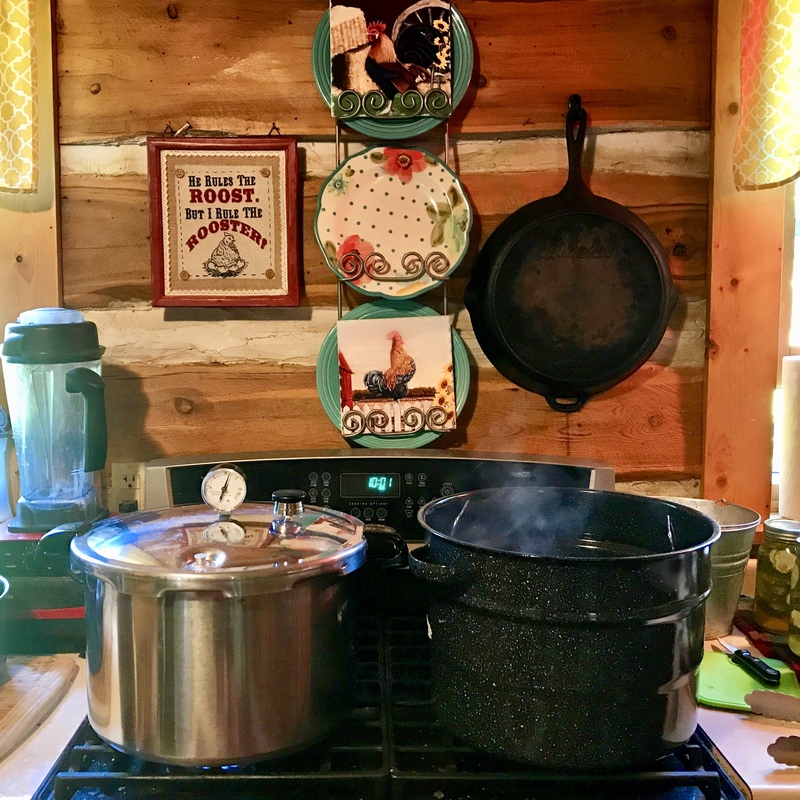 Since our family time and being self-sufficient is important to us, we will be making apple crisp for weekend breakfasts to go along with John’s homemade waffles. I will be busy canning apple pie filling and applesauce for our winter table. 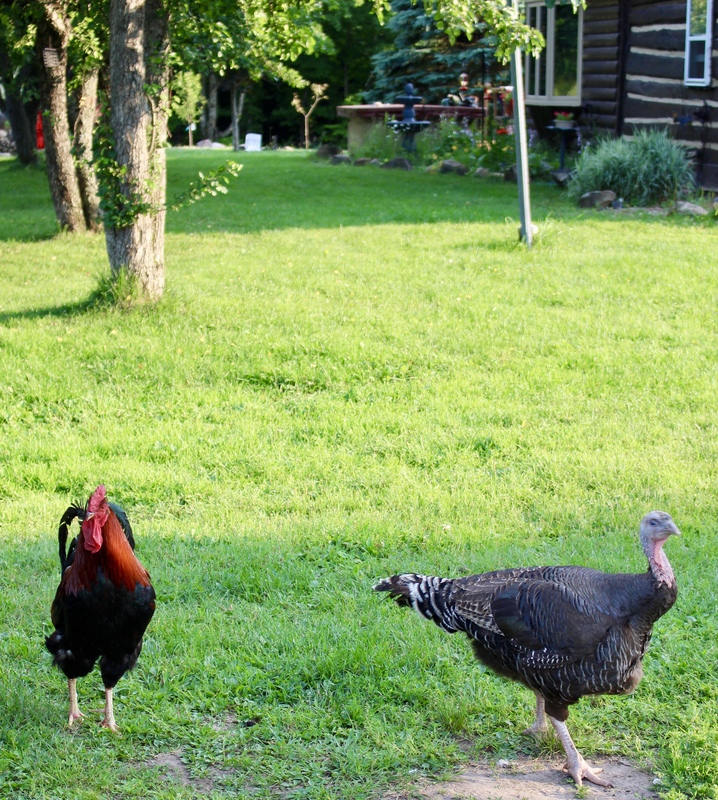 I hope to squeeze out a few more front porch sessions watching our roosters Shakespeare and Hamlet strut around the yard as the sweet hens and Harriet the turkey warble and free range. Maybe you will join me for some virtual hot apple cider? Make sure that you stop by my Facebook page or leave a comment here for how you are celebrating the autumn and not forget to tell me what you think about this salad. John bought me a pressure canner to preserve our harvest. Our shelves are filling up fast. 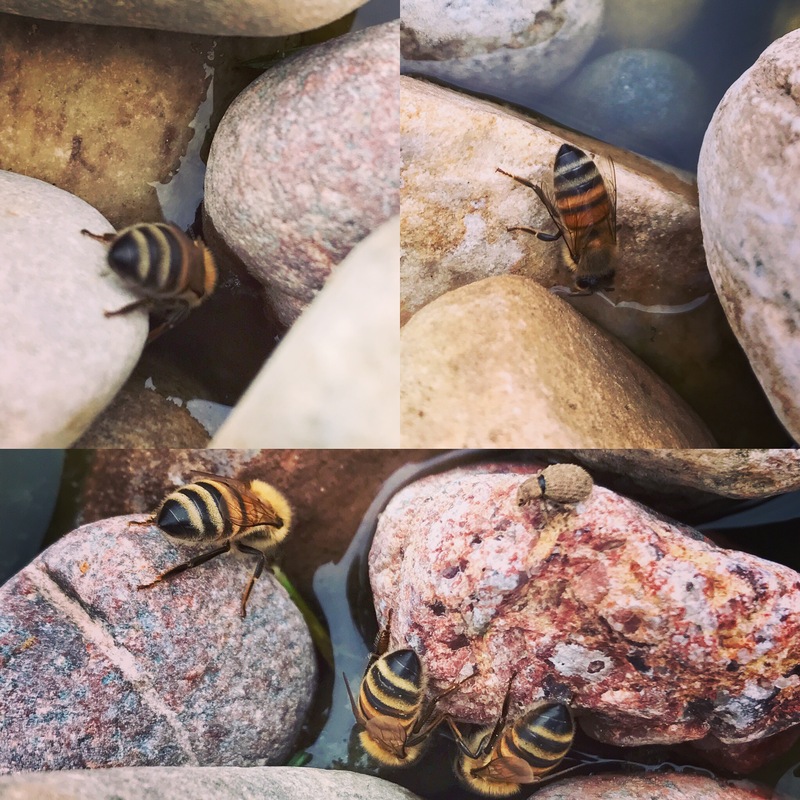 Our honey bees stopping to take a drink from the pond.